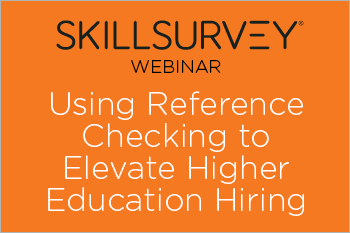 See how SkillSurvey’s automated reference checking solution turns data into insight to improve hiring in higher education. “SkillSurvey is a very good tool, because the solution brings all of the references together in one location, allowing me to take a look at the strengths and weaknesses of the candidates. And if you can’t hire right, you can’t build a successful organization. Because at the end of the day, it’s not the buildings, it’s not the computers, it’s the people that bring success.” Dr. Venkat Reddy, Chancellor, University of Colorado Colorado Springs.